At The Reef we aim to operate in harmony with our surroundings, always recognising that development increases the stresses and demands that are placed on our natural resources. Our business is located within an area that is internationally-recognised for its natural beauty and biodiversity – the Pointe Sable Environmental Protection Area (PSEPA) – which comprises some 1,038 hectares of land and sea stretching from Pointe De Caille in the North to Moule a Chique in the South. Back in 1997, Cecile, the owner of The Reef was the founding chairperson of the then Pointe Sable National Park planning committee which carried out a pilot project in collaboration with Government agencies and NGOs – to lay the groundwork for designation of the current area with its offshore islands, dry forests, beaches, coral reefs, unique flora and fauna, mangrove and fishery resources and historic sites. 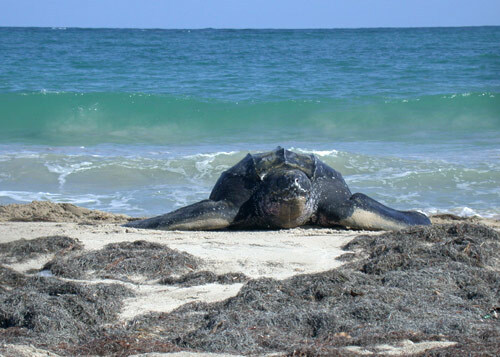 Sandy Beach is a leatherback turtle-nesting site. These magnificent creatures can grow to more than 7 feet in length, weigh up to a ton, and can live for up to 100 years. Every year from around mid-March to the end of July, many return to Sandy Beach – the beach of their birth – digging into the sand during the night to lay their eggs in a nest which they then cover over before returning to the sea. Occasionally daylight may find a turtle still on the beach, (such as the one in the photograph that we found one morning), but this is the exception rather than the rule. By avoiding the use of heavy equipment, tractors or mechanical digging/raking of the beach, we aim to protect the fragile turtle nests and ensure that the beach sand is not unduly compacted, making it difficult for the turtles to dig and the hatchlings to emerge. One of the things you may notice at The Reef is that this beautiful white, sandy beach is not one of the pristine, manicured spaces typically depicted in postcards. Don’t worry, there’s plenty of space for everyone to enjoy, but the relative abundance of vegetation is deliberate … the extensive root systems of the beach vines help to protect and retain the sands during times of heavy wind-and-wave action which is critical during our annual hurricane season. Plant biologist Roger Graveson and assistant Melvin Smith spent 15 years studying plant biodiversity throughout every nook and cranny of St Lucia. The result is an amazing website cataloging every plant species on the island – images, species, common name, botanical name, medicinal uses etc: http://www.saintlucianplants.com. Not only did Roger and Melvin identify a flowering shrub that only grows in one location at Sandy Beach – and nowhere else on the island – but an ongoing project with them will ensure that other indigenous beachfront trees and plants are re-introduced to the area around The Reef. Coastal development tends to bring with it an emphasis on ‘beautifying’ beachfront areas to suit a particular aesthetic, often by introducing alien and sometimes invasive plants at the expense of the native species. Every Vieux Fortian child knows the succulent, salty-sweet grapes that grow on the trees all along Sandy Beach, and during seagrape season, the trees come alive with youngsters up in the branches shaking with all their might to dislodge the bunches of small, burgundy-coloured fruit. Several months after the passage of hurricane Tomas in 2010, we noticed that the Sea grape trees in our area were being infested by whitefly and some form of fungus or blight. As the leaves continued to shrivel and the branches slowly turned black, we approached the Ministry of Agriculture to seek their advice. The result was a project that involved oversight by the Ministry, manpower from the Vieux Fort town council, a donation of detergent from Chemico – the local manufacturer, the loan of a mist-blower from the National Fairtrade Organisation and input from The Reef in providing logistics, fuel for the machines and preparation of the mild solution of environmentally-friendly detergent that was recommended for spraying. After trimming and burning the deadwood, spraying commenced and within a matter of weeks, positive results were visible. 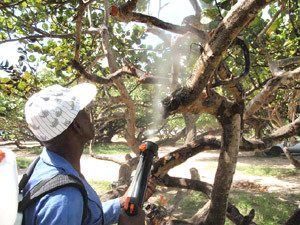 The project has since been handed over to the St Lucia National Trust who have taken on the long-term responsibility for spraying and monitoring. Hopefully the tradition of seagrape-picking at Sandy beach can continue for generations to come. About 1000 yards directly offshore from The Reef lie the twin Maria Islands. These Islands were declared a Nature Reserve in 1982 by the Government of Saint Lucia in recognition of their special function as a wildlife habitat and their unique flora and fauna. 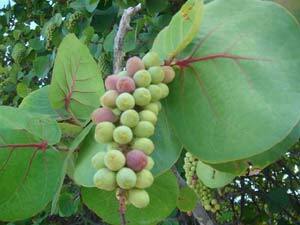 There are over eighty (80) plant species found on Maria Islands. The island is home to five endemic reptile species such as the world’s rarest snake – the Kouwés snake (Saint Lucia Racer), The Saint Lucia whiptail (Zandou), The Worm Snake (non poisonous), The Pygmy and Rock geckos as well as several species of cacti and undisturbed tropical plants on the vertical cliff. The island is also a major nesting site for migratory birds which travel thousands of miles from the west coast of Africa to nest annually. It is usually closed for the nesting season which runs from May to August. A snake that scientists had declared extinct long ago has been found living in a nature reserve on a tiny isle just off the east Caribbean island of St. Lucia, conservationists said Tuesday. At least 11 St. Lucia Racer snakes were spotted and tagged by a group of international scientists hunting for the snake in the Maria Islands reserve, which is part of St. Lucia and located about 1km south of the main island, according to the British-based Durrell Wildlife Conservation Trust. Overall, scientists estimate that 18 snakes live on the reserve, said Matthew Morton, Durrell’s Eastern Caribbean program manager. The non-venomous brown snake was declared extinct in 1936, but somebody later spotted one on the rocky reserve in 1973 and rare sightings have since been reported. Late last year, Durrell, with help from the US Fish and Wildlife Service and other groups, launched a search for the snake on the larger of the two Maria Islands. A team of six scientists and several volunteers spent five months scouring the rocky outcrop where they found some snakes slithering around during the day, looking for lizards and frogs to eat. Once they captured the snakes, they implanted microchips that will transmit data for at least 10 years, including information about their lifespan and other unknown details, Morton said. The Maria Islands are administered by the St Lucia National Trust and all access is by appointment, accompanied by a certified tour guide. We work with the National Trust to arrange tours of the islands.